*All tax deductible donations $5 or more made until Dec 31, 2012 recognized online with a live link of your choice on the 2012 sponsor page. Please join our list of 2012 supporters. We ask now for your end of year donations which are fully tax deductible and look forward to seeing all of your names on our 2012 Supporters list which is now posted. 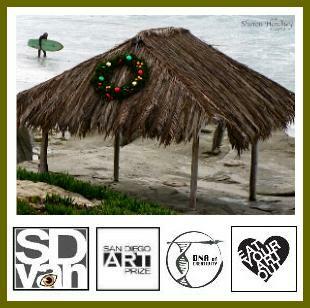 San Diego Visual Arts has positioned itself to be of optimum support for the visual arts community In 2013. The DNA of Creativity is one of the most inventive art and science collaborations for the STEAM initiative. (STEAM combines science, technology, engineering, art and math together). SD View Art Now,our smart phone app will pin points local arts events from the San Diego Visual Arts Network calendar on a GPS map identifying the viewers position. . Our calendar is free and accesses the events in our directory of over 2000 visual arts resources. Both of these projects are moving San Diego in the right direction for innovative economic growth..
We continue with our programs highlighting the best of the best with our SD Art Prizeand its mentoring program for emerging artist showcased in the New Contemporariesexhibitions. We have produced a variety of other programs including the 2012 Hats Off to Life shining a light on our retirement community, mentoring students in marketing with opportunities at the Mission Federal Art Walk as well as artist who not only demonstrate their skills but enable the large viewing audience to participate in a hands-on activity. We give featured event status to hundred of events a year, mention art professionals, art activist and art opportunities in our RAW column and post reports on dozens of art exhibitions in our Picked RAW Peeled blog.